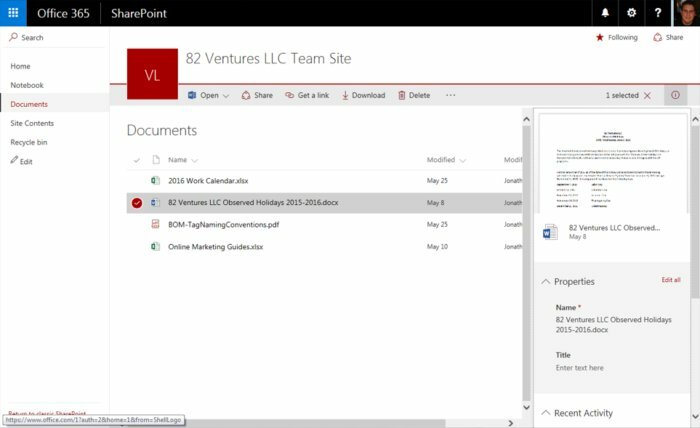 Learn how to find your way around SharePoint Online, create sites, share and manage documents, work with calendars, integrate with Outlook and more. If you have never heard of SharePoint, you have probably been living under a rock. Microsoft’s enterprise collaboration platform is embedded in almost all medium and large organizations in some fashion or form, and SharePoint Online is part of the Office 365 subscription service, meaning that hundreds of thousands of users have access to the software. As part of the Office 365 subscription, you automatically get the latest version of the software. But SharePoint is as complex as ever, and if you’ve used earlier versions of SharePoint, you’ll find that in the 2016 and Office 365 “next wave” releases, Microsoft has definitely moved the cheese. The interface is different than it was in earlier versions of SharePoint, and some ways you interact with the software have changed. Or perhaps you are new to SharePoint, or are interested in teasing out the power of SharePoint Online as you work with your team. That’s what this cheat sheet is for. 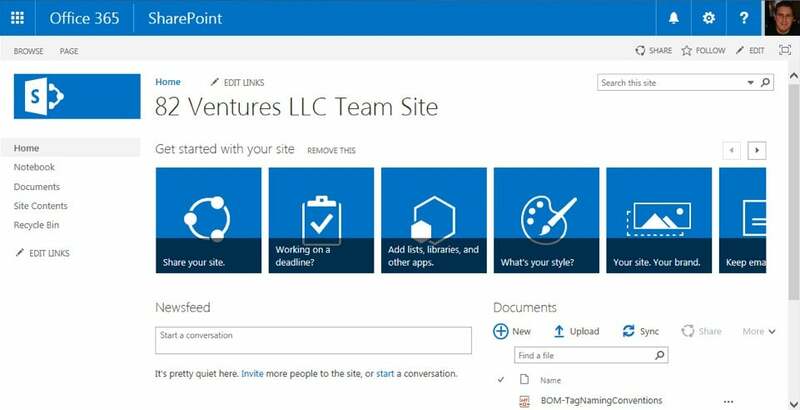 Inside, you’ll learn all of the basics of navigating and using a SharePoint site, and where to go to hit some of the customization options as well. The Frequent section shows you a feed of items that you've worked on recently and items that people who are on your team or with whom you frequently interact are working on. For easy access, you can click the star icon in the top right corner of any site to follow the site and have it appear in the Following section when you log into SharePoint. 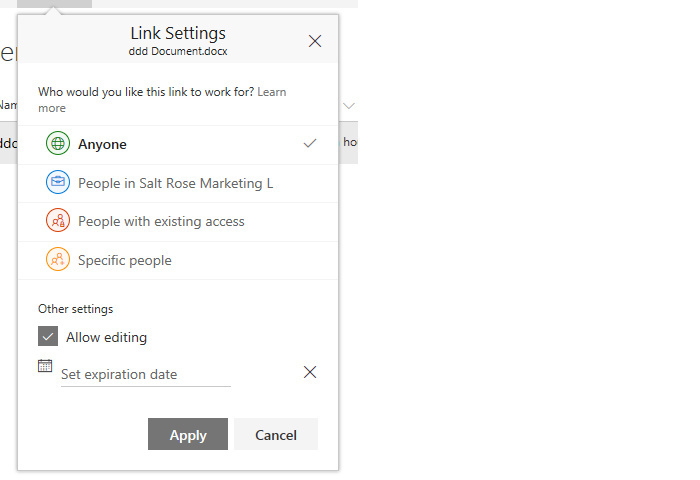 The Featured Links section is where your administrators can pop out important links to areas of the site you might need — things such as HR site links, vacation requests, your organization's social network, and more. Think of it as a quick-launch bar, but one that is curated by your IT department. If you have administrator rights to a site, which is generally the case if you created a site yourself, you’ll also have an Edit link you can use to populate this list. The credentials area. This menu, accessed when you click on your display name in the top-right corner of the web page, is where you can sign into or out of a site, and where you can change any user-modifiable sections of the web page (known as web parts, or little bits of code that are sometimes installed on SharePoint pages to do specific functions). Most SharePoint pages have the Browse tab on by default, which gives you a breadcrumb-style hierarchy helping you to navigate among pages on the site and see how you arrived at the current page. If you’re in a document library, the Library Tools Ribbon tab will appear; if you’re in different types of lists, the tools will differ in the Ribbon. Under the Ribbon on the right, you will find the Search box, where you can type any sort of search query in, click the magnifying glass icon to the right, and then take advantage of the indexing engine on the site to get comprehensive results from any file that includes your search term. The Quick Launch bar, running along the left side of your SharePoint web page, helps you jump among the various parts of your site, including to different lists, libraries, discussion areas, picture collections, the site Recycle Bin (which works exactly like the Windows recycle bin except it holds items from the SharePoint site only), and a full tree-like view of all the places on your site. The whole point of SharePoint is to be a place where things can be shared. 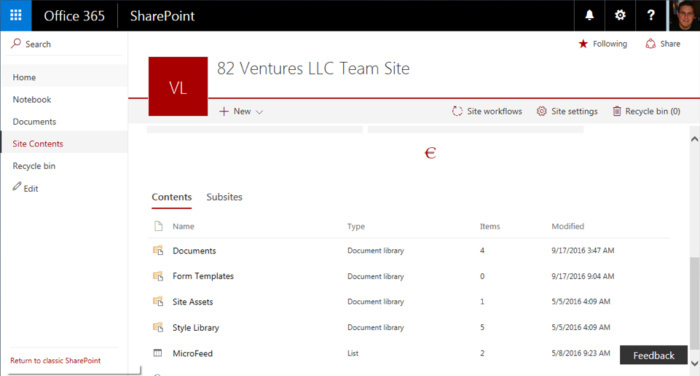 Everything from documents to calendars to lists to pictures to discussion boards and more — all of it can be a part of a SharePoint site, and any user within your organization’s network (and in some cases, even users outside of your network, such as partners or vendors) can access those pieces and collaborate with you. A page. A page is exactly what it sounds like — a page that is edited within the browser using the editor functionality in SharePoint. These pages primarily contain text, but you can embed images, links, lists, and other apps within them. A document library. You can create a document library that lets you upload Word files and other files to share. These document libraries offer the ability to check files out to make sure that only one person edits them at any given time, to keep versions on file so that you can see the revision history and activity of a given document, and to create folders to structure documents logically within the library. Other kinds of libraries. There are form libraries, which store XML forms that your business can use to route information through Microsoft InfoPath; picture libraries, which just store image files; and wiki page libraries, which basically create a quick way to edit text and have it remain on the web as well as link that text to other pages — a poor man’s shareable text editor, you might say. A list. Lists are collections of like items. You can choose from a list of links, announcements, a calendar, a list of contacts, a suggested site of links, a custom list in both list form and an editable datasheet form, a discussion board, an issue tracking list, a list of links, a list of project tasks (with a Gantt-like chart), a survey, a task list, or an imported spreadsheet. You can then simply email hyperlinks to documents on the SharePoint site when collaboration needs to happen, and as users modify and update files, the latest version — as well as previous versions, if you wish — is stored in a single place, along with the history of who revised what, when. To get started sharing documents and files, you will probably need to create your own document library. This is fairly straightforward. 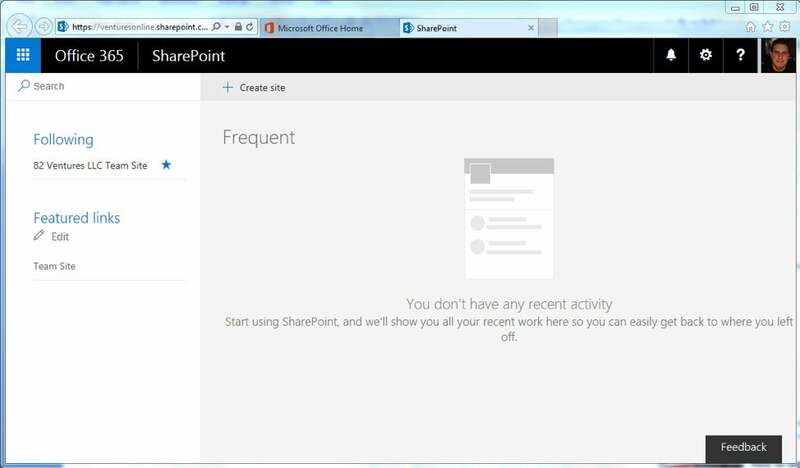 Open SharePoint in your web browser. From the Site Settings menu (this is the cog wheel icon at the top right of your window), click Add an app. On the Site Contents > Your Apps screen, click Document Library under either the Noteworthy section or the Apps You Can Add section. They both point to the same place. The Adding Document Library pop-up appears, where you can give a name to the library and click Create. If you want, you can customize the library a little bit at the same time you are creating it by clicking the Advanced Options link, which brings up the Site Contents > New screen. Enter a friendly name and a useful description for your new library. Choose whether or not a version of the file is created each time someone edits a file in this library. When in doubt, choose yes — you would be amazed at how often this versioning history comes in handy. Select a type of template that will become the default template for the library if someone chooses the New File option on the Ribbon. This is not an important choice, as a document library can hold just about any type of file. Click Create to close out and be taken directly to your new library. Once you’re in the document library, you’ll see a main menu running horizontally across the top of the page where you can create or upload files, kick off the synchronization process with OneDrive for Business, or take other actions. For example, you can very easily add new content to the library by clicking the “+ New” link to create new content, such as a Word or Excel file, directly in the system, or click the Upload button to put an existing document into the system. The main menu will change based on when you select a folder or file individually as opposed to just looking at a list of items, and it will reflect all of the actions you can take with a folder or file — like sharing it, getting a link, downloading it, deleting it, moving or copying it, and so on. You can also right-click on the file or hover over the file in the list and hit the ellipsis menu (...) next to the file name to get a neater, tighter list of actions you can take. At the top right, you can change your view from All Documents to a list of items, a grid full of items (useful for previewing photos and other visual items), or the All Documents view. You can also save custom views here and manage them, but you have to be an administrator to do so. If you are browsing using Internet Explorer, then you can click to view the library in File Explorer or Windows Explorer. In list or grid view, you can add and rearrange columns by clicking the + and Arrange buttons. The details pane, shown at right in the screenshot below, is part of Microsoft’s attempt to enroll us all in the process of keeping clean metadata about files and other items. This makes it much easier for SharePoint to learn what we work on and to populate suggestions about related content, for administrators to be able to apply record retention policies and document lifecycle management, and for search to return better, more relevant rresults, among other benefits. You can just select any item and then click the i on the right of the menu — this will open up the details pane where you can edit names, titles, the authors of documents, and much more. If you hover over the file name in the list and then click the three dots (the ellipsis) beside the file, you get a complete menu of options. Open/Edit. Here you can open documents either in the Office 365 online versions of their respective apps or the desktop versions — Word for Word documents, Excel for spreadsheets, and so on. Share. Sharing lets you add other people to a document. 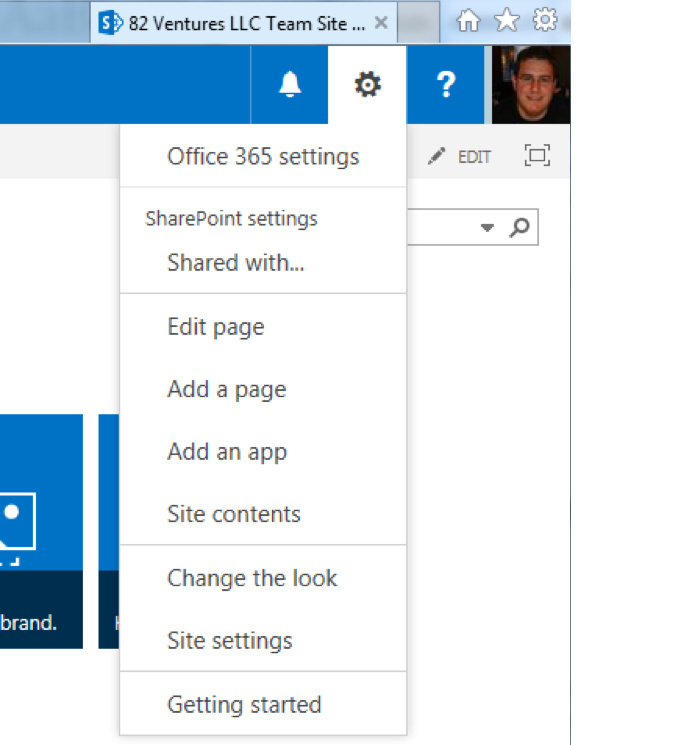 In Office 365, you get a much richer selection of options for sharing than you do in on-premises-based SharePoint. Anyone, which makes the document public and anyone who gets a copy of the link (say, from a forwarded message or from a share on social media) can access the file. People in [company name]. 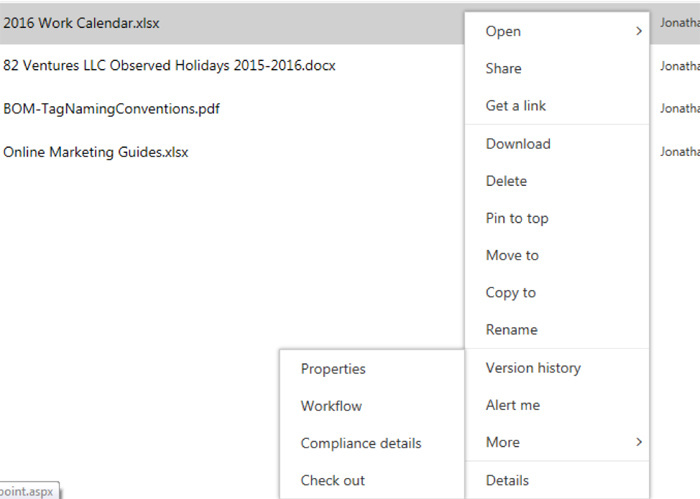 This makes the document available to anyone with access to your SharePoint site, even if they don’t already have access; it prevents anyone externally from seeing the document. People with existing access. This does not change permissions at all but simply generates a link for convenience and easy sharing. Specific people. This allows you to invite individual folks, including those external to your company, to view (and, if you choose, to edit) the file. You can also, at the bottom of the list, elect to allow the “sharees” to edit the file, as opposed to just viewing a read-only version of it. Additionally, you can choose to expire this access after a certain date, an option I heartily recommend for security reasons. Once you click Apply, you can add the names and email addresses of the people to share with, and you can create an optional message to include with the email these folks will receive that contains the link. Download. This gives you a prompt to save a copy of the document to your local computer. Delete. This simply deletes the file, after a confirmation prompt, from the document library. A copy is stored in the site’s Recycle Bin (accessible by default, unless your administrator has turned this feature off) in case you delete something by mistake. Pin to Top. This pins a link to the document in question to the top of your window. Move To and Copy To allow you to put documents in different libraries or other locations on your site. Version History allows you to access previous saves of a document as long as versioning is enabled on your document library (it is by default, so you or an administrator would have needed to change this setting for this feature to not work). You can see dates and times of each individual save, see who performed the save, and view any comments that author made at the time of the save. Alert Me. This lets you configure email notifications whenever actions happen to a file — useful if you want to be kept up to date when people are editing a certain document, spreadsheet, presentation, or other item. Properties. Selecting this option opens the document properties page, where you can adjust the name and title of the document. Workflow. The workflow option allows you to configure automated actions to occur when users save or otherwise edit a document. This is an advanced option with lots of scope beyond this cheat sheet. Ask your administrator if you’re curious. Compliance Details. The compliance details option lets you manage the document’s lifecycle and how long it will be stored before being archived, among other things. Your administrator generally sets this up. Check Out. The Check Out option locks a file for editing by a single user. If other users attempt to save back to the file, they’ll be notified that they can’t until the user who has the file checked out currently then checks it back in and makes it available for editing.